In my opinion, straight-leg jeans are the most versatile style in the entire denimsphere. Now, before you skinny-jean devotees and wide-leg jean lovers chime in, what other denim styles can you confidently say look great with everything from Manolos to ballet flats? We make a good case, don't we? (So modest.) First, straight-leg jeans are characterized by a relaxed look from the thighs down to the ankles. The classic cut tends to look good on everyone, and they have an inherently polished feel thanks to the stiffer denim. Perhaps the greatest attribute to straight-leg jeans is that they can be styled in so many cool ways. Pairing them with cowboy boots and a blazer (just like fashion editor Alexandra Carl) is a shortcut to looking cool while white straight-leg jeans with matching trainers and a slogan tee will win you instant style points. This cut can also act as the perfect middle ground between your "fancy" top and your "show-off" shoes. 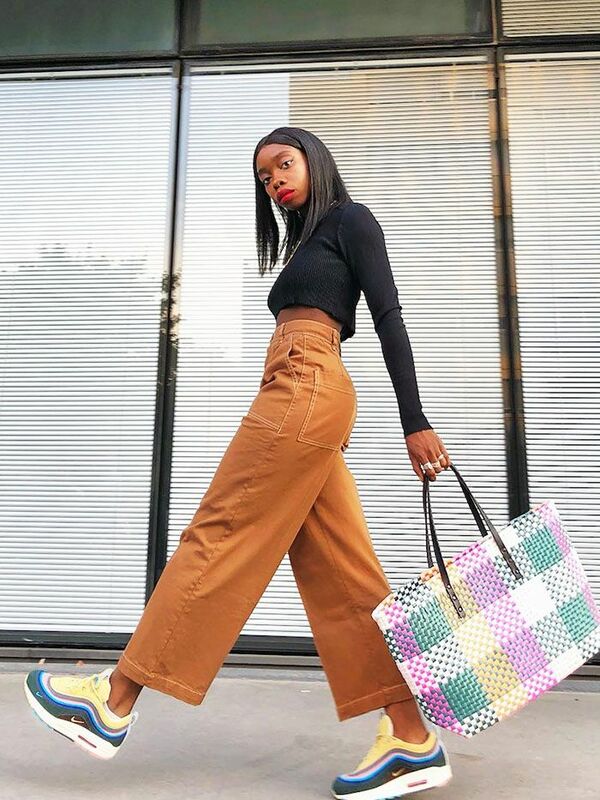 Keep scrolling for our five best ways to wear straight-leg jeans, and then shop the pieces required for each ensemble. Straight-leg jeans look excellent when paired with a show-off top. Whether you're rocking bold shoulders, extreme puff sleeves or sequins up top, they act as the perfect low-key antidote. Make like Linda Tol by tucking in your blouse and adding some glitzy footwear. Pair your straight-leg jeans with cowboy boots (one of this season's key boot styles), a blazer, and a white crewneck for one of the easiest yet chicest outfit formulas we know. Style tip: Get your hem just right so that it slightly overlaps the top of your boots for an effortless detail as seen on Alexandra Carl. We told you straight-leg jeans were versatile. Abandon your boots and swap out for your best white kicks for a comfortable yet chic look. We love Tamu McPherson's white pair with the addition of a slogan tee and blazer. Airport lounge perfection. As a rule, it's always better to show up to the party overdressed rather than underdressed. So for those moments when you feel black trousers would take you into cocktail party territory, straight-leg denim makes for a good option. Opt for a darker wash to keep your look polished. How effortlessly cool does Camille Charrière look pairing her straight-legs (note the pale wash) with velvet ballerina pumps and a chic blazer? We're stealing this look.